It would appear that the G.O.D. of the Yu-Gi-Oh! ARC-V manga has sought to grace existence. 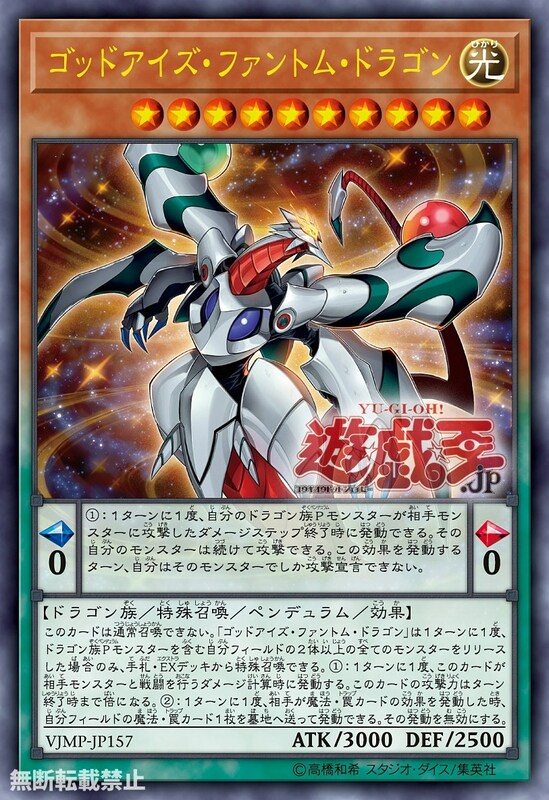 (1) Once per turn, if a Dragon Pendulum Monster you control attacks an opponent’s monster, at the end of that Damage Step: You can activate this effect; that monster you control can attack again in a row. You cannot declare attacks the turn you activate this effect, except to have that monster attack. Must be Special Summoned (from your hand or Extra Deck) while you control 2+ monsters, including a Dragon Pendulum Monster, by Tributing all monsters you control. You cannot Special Summon “God-Eyes Phantom Dragon” more than once per turn this way. (1) Once per turn, if this card battles an opponent’s monster, during damage calculation: Double this card’s ATK until the end of the turn. (2) Once per turn, when your opponent activates a Spell, Trap, or Spell/Trap effect (Quick Effect): You can send 1 Spell/Trap you control to the GY; negate that activation.